I got up a couple of times in the night to add coal to the fire. It was snug in my sleeping bag, Reuben snoozing close by and the sound of wind and rain outside. The candles burned for hours giving the room a cozy flickering glow, driving the bothy ghosts into another room. The room was dark and gloomy when I woke in the morning, grey leaden skies preventing much light getting through the bothy window. I got up and shuffled to my stove, my breath hanging on the cold air. The stove roared into life and within a couple of minutes I had a cup of hot coffee in my hands. I was dismayed to see that the rain was still falling, I once again began to worry about crossing the river and getting back to the van. Apart from my usual breakfast bacon noodles my food bag was empty. I think I would have to be trapped for a few days however before I considered eating the dog. The buckets of water for the loo needed filling so I took a walk down to the river, my boots still soaking wet from the crossing the day before. Thankfully the river had reduced to half the size so I immediately felt much more relaxed. An enjoyable couple of hours was then spent in the bothy, eating noodles and drinking coffee before finally packing and heading off into improving weather. The walk back to the Bongo was much easier that the day before, streams were once again confined to their banks and the surrounding mountains were revealing themselves. 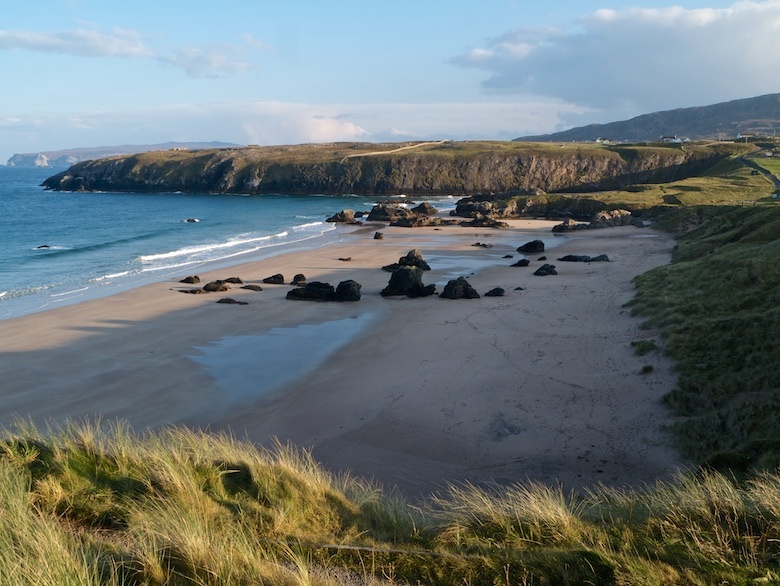 Traigh allt Chailgeag was a worthy stopping point on the road to Durness. After a few days in the bleak Sutherland hinterland it felt like I was in different country. The wind had dropped, the sun shone and waves lapped gently at the shore. I was going to pay Smoo cave a visit but as I passed I was put off by the general hustle and bustle. Ok it was hardly Keswick on a bank holiday Monday but after days without seeing a soul it all seemed too much. I did not feel ready to join the great washed. I still had bits of Sutherland dirtying my clothes and I was long overdue a shower. The shop in Durness was an Aladdins cave of treasure. They even had Arran Blonde which is one of my favourite beers. 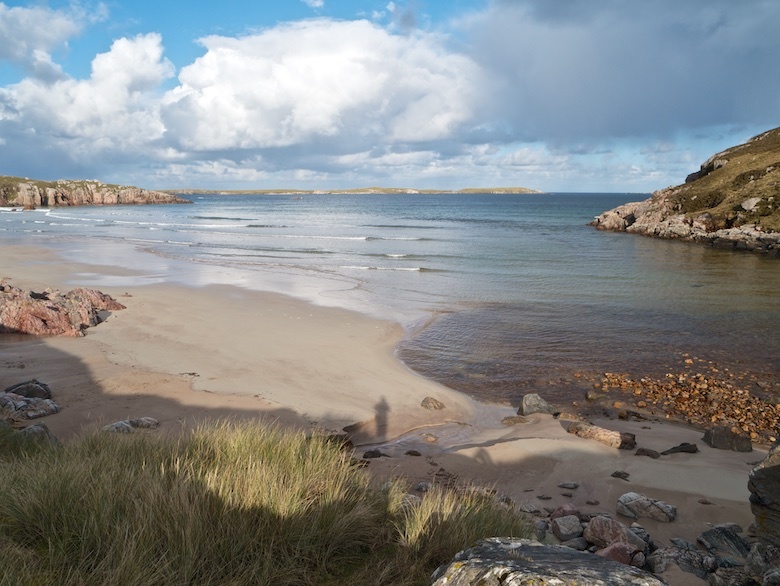 I hauled my bounty back to the Bongo and drove the short distance to Balnakeil bay. A hefty shower meant that lunch was eaten in the van. An almighty bang suddenly rattled the windows and Reuben cowered in the passenger seat. I initially thought that it was thunder but noticed a group of people staring out to sea. I got out of the van just in time to see a low flying jet, then a plume of smoke on an island to the north of the Cape Wrath peninsular. Seconds later there was another mighty boom. The military were playing with their weapons. It was too late in the day for a big walk so I spent a pleasant hour with Reuben walking the coast path leading to Keodale. The weather was ever-changing. 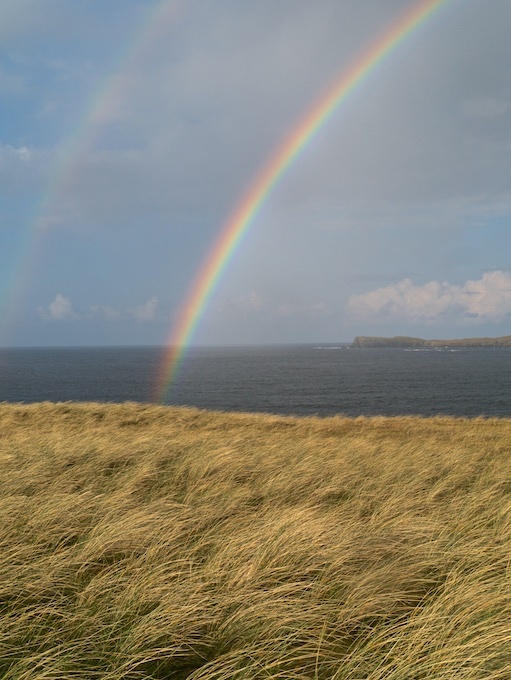 Bright sunshine, white clouds, black skies, sun, hail and rainbows. The grass in the dunes rippled in the wind sending patterns into the distance. 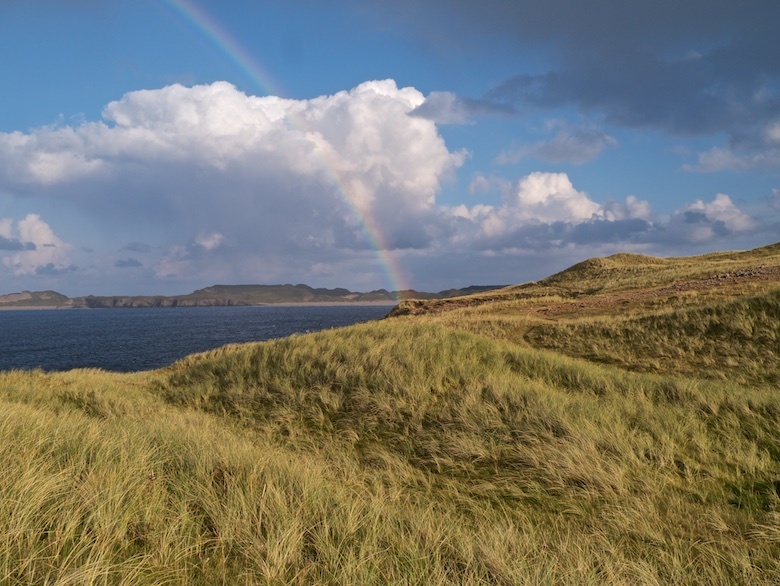 Reuben got the wind in his sails and sped across the dunes with a grin on his face. I later checked into the Sango Sands campsite in Durness, time for a shower and to top up the Bongo’s water supply. By then there was barely a cloud in the sky and I picked a grassy spot right on the cliff top. I double checked that the handbrake was on, otherwise it would be a very quick trip to the beach below. 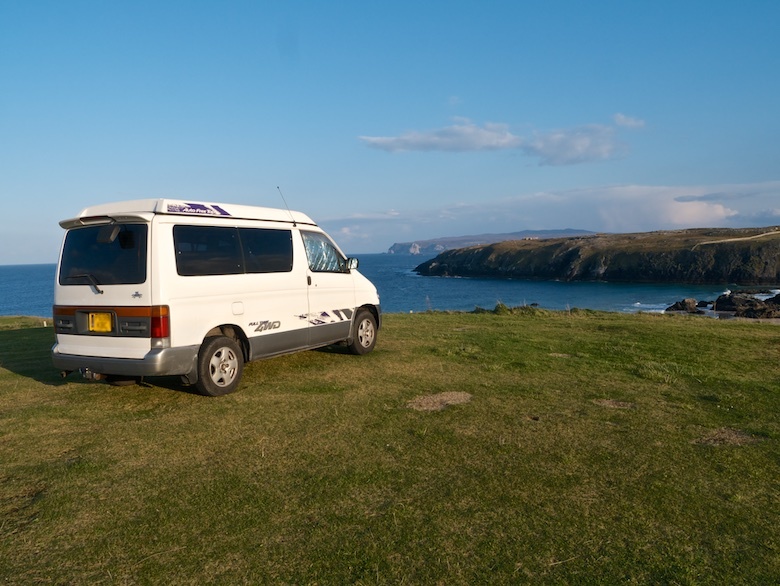 There was only a handful of other vans on the site, braving the weather in the far north during the school holidays. In the last of the afternoon light I had the beach pretty much to myself bar a couple of surfers. Reuben loves being on sand and raced around in huge circles, ripping up any seaweed that he could find. Later that evening after reviving myself under a hot shower I paid a visit to the ‘pub’ next door. I was looking forward to a pint and a good bar meal. I was bitterly disappointed, for some reason the Highlands don’t really do cosy country pubs. The best I could find in the land of Tennents pish was a pint of Guinness. My meal consisted of frozen chips, frozen scampi, tinned peas and some strangely artificial looking carrots. It was also not very cheap. I could not bring myself to stay for a second pint. With the best weather of the week forecast I was up and away early. 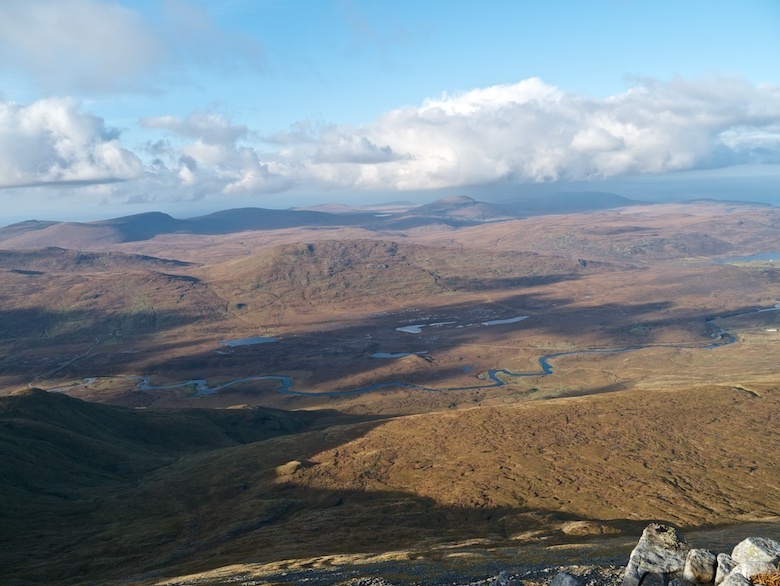 With sunshine promised along with much lighter winds I was determined to get up a mountain. 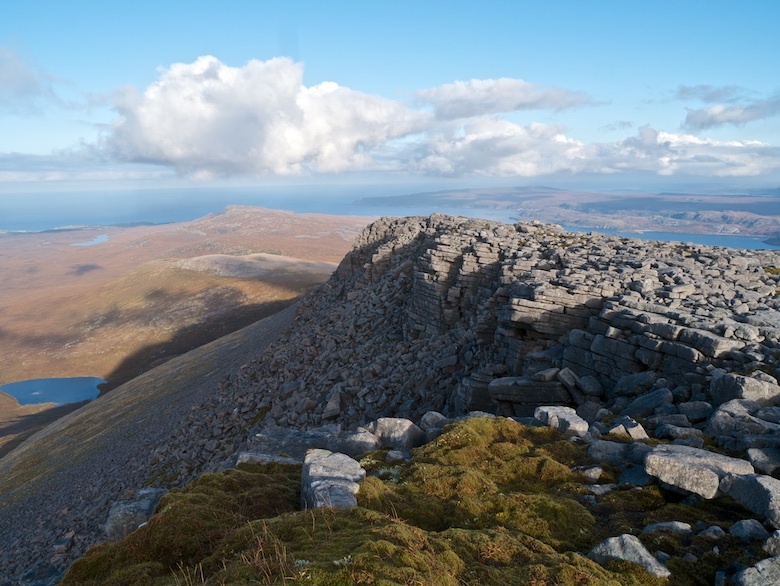 Beinn Spionnaidh is the most northern bit of significant high ground on the mainland and from looking at the map I thought it should give good views of the north coast. Adding its higher neighbour Cranstackie would give a short outing in terms of mileage but plenty of ascent and descent. There is parking for a few cars a couple of hundred metres from the cottage at Carbreck. We took to the track that leads to the isolated farm at Rhigolter, almost reaching it before I realised that I had left my water bottle back at the van. I decided against the nearly two mile round trip to go back and collect it, I reasoned that water should be easy to find on the hill. We picked up the track round the back of the farm, setting off the dogs barking. The track has been extended further than the map suggests, an ugly scar on the hillside I would imagine is too steep for most vehicles. 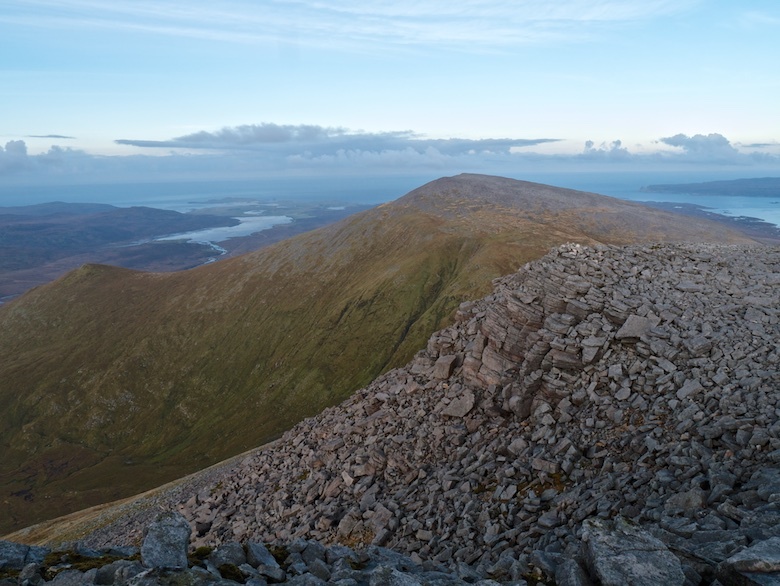 We soon left it and climbed very steep grass slopes to Cioch Mhor and finally onto the plateau of Beinn Spionnaidh itself. 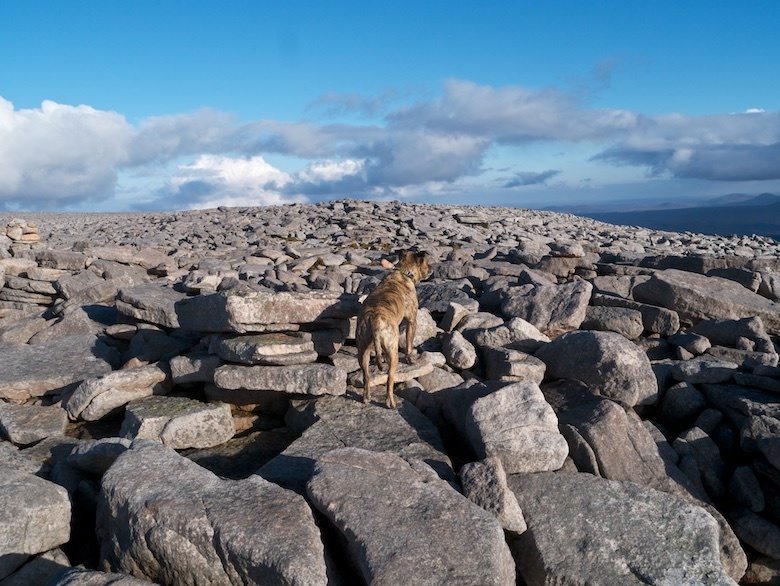 The summit plateau is one of the rockiest that I have visited, acres of flat boulders which needed care to cross. It would be a real ankle breaker under a covering of snow. Even Reuben took his time, worried as they wobbled under his paws. The view from the summit was even better than expected. 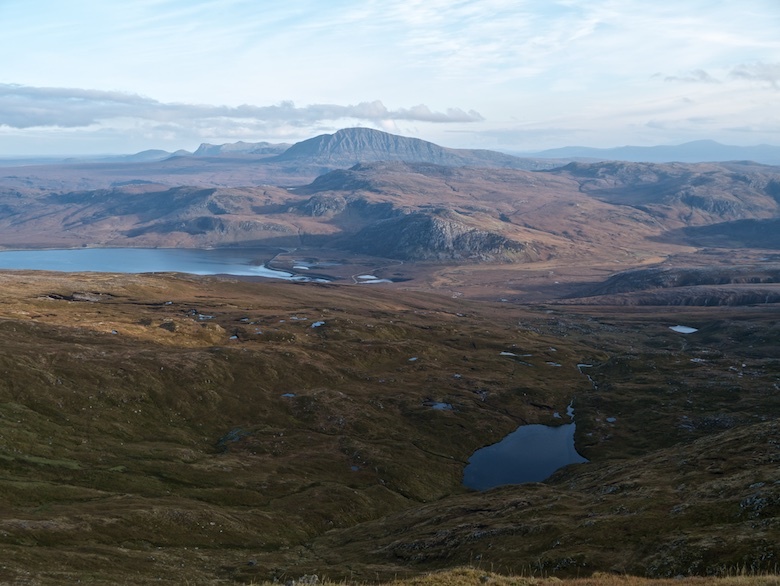 The whole of the north coast was spread out beneath my feet, the mountains of Ben Loyal and Ben Hope rising from the flat moors. 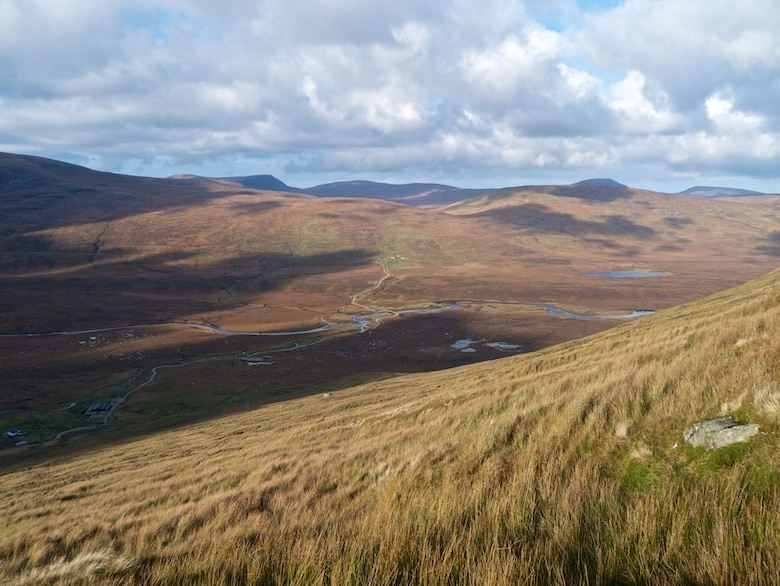 The wilderness of the Parph, a huge area of low hills south of Cape Wrath looked especially inviting under the low Autumn sun. I sat for a long time enjoying the views and solitude whilst I ate my lunch, cursing the fact that I had nothing to drink. 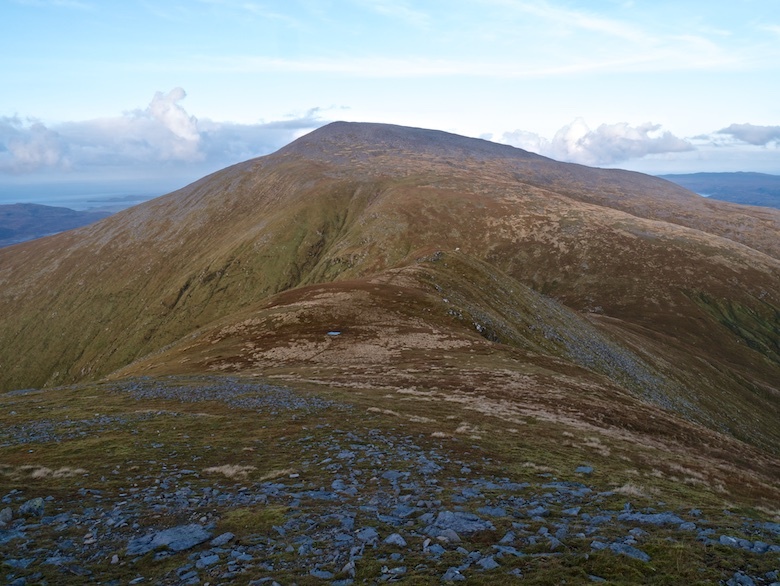 With both hills being Corbetts there was a long descent and ascent to reach the summit of Cranstackie. 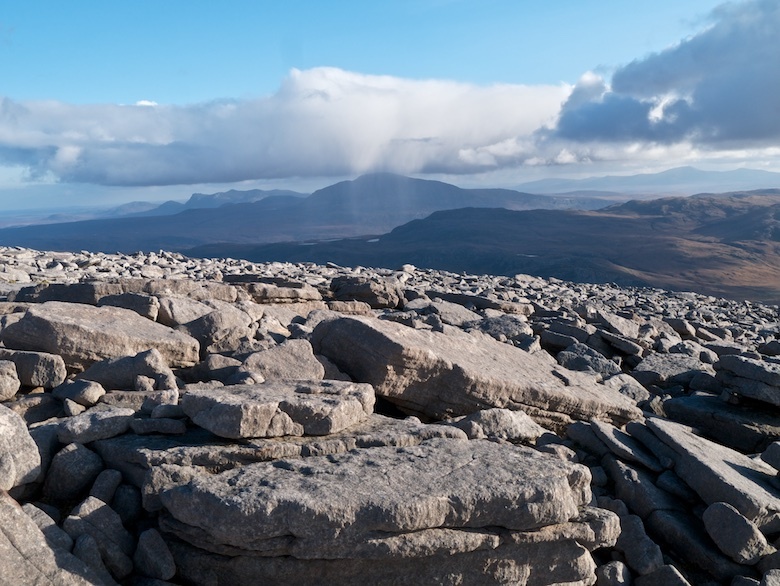 The views from that cairn were more about the mountainous Sutherland hinterland than the coast. 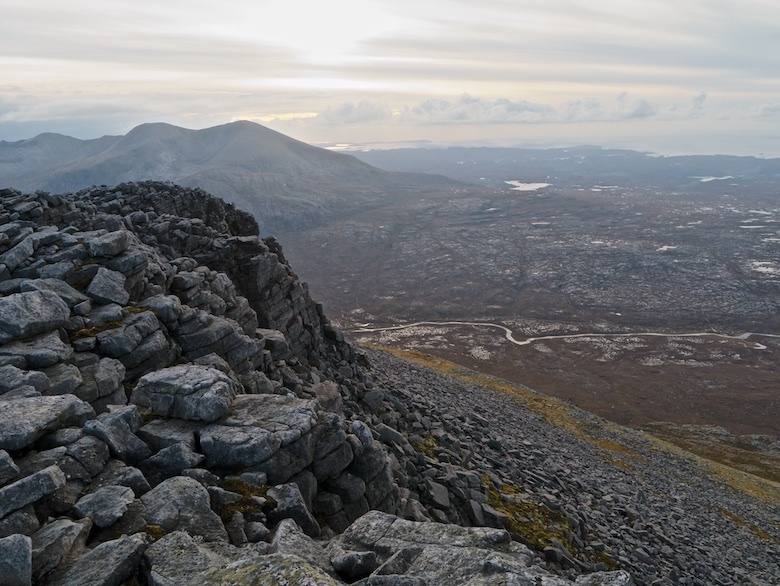 Foinaven dominated the view to the south, the hills to the south-east being comprised more of rock and boulder than vegetation. 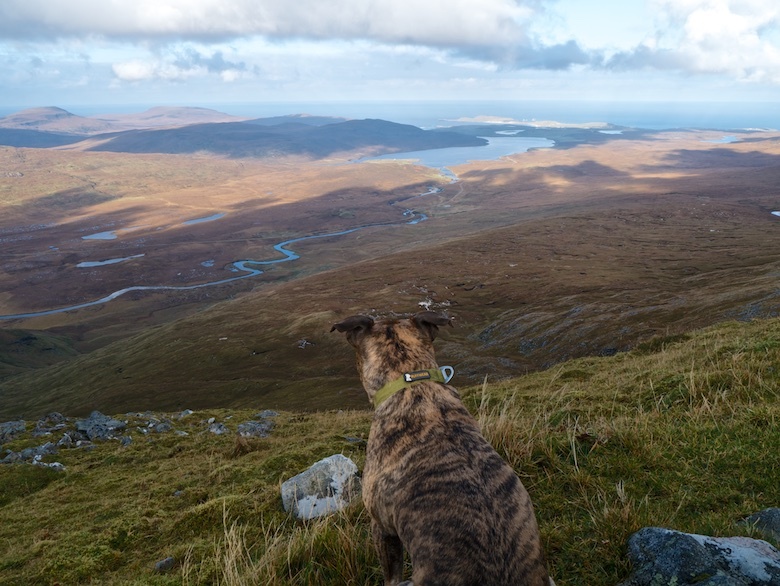 We descended back to the bealach between the two hills and picked a way down very steep grass into Calbhach Coire, herds of deer scattering as we approached. 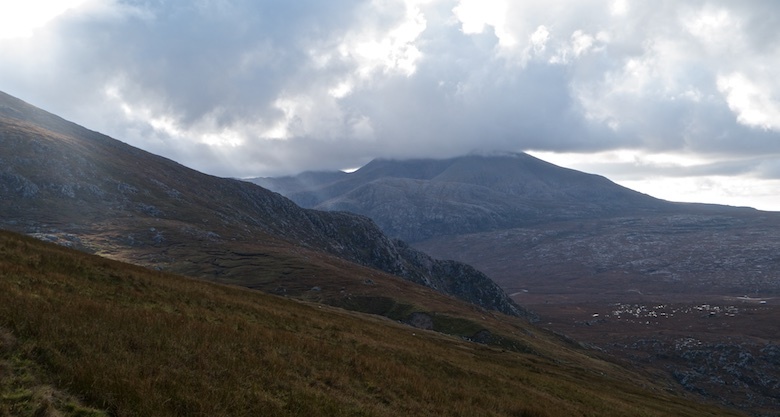 It took a while to pick a way through the boggy coire and down to the farm at Rhigolter. With wood smoke coming from the chimney and lights from the living room it looked very cosy. By the time we had walked back along the track and back to the van it was pitch black. Time to find a good spot in which to spend another long dark night. 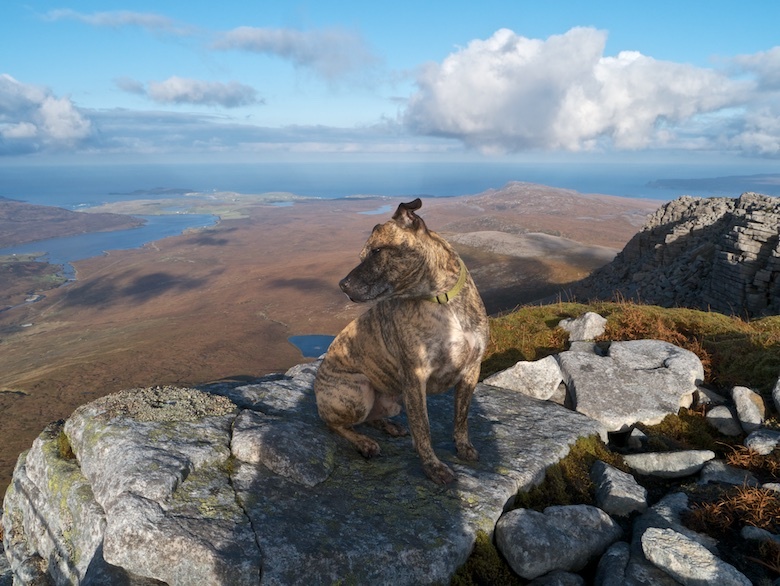 That is so wonderful James, fantastic scenery, amazing photos and Reuben has a little smile on his face! 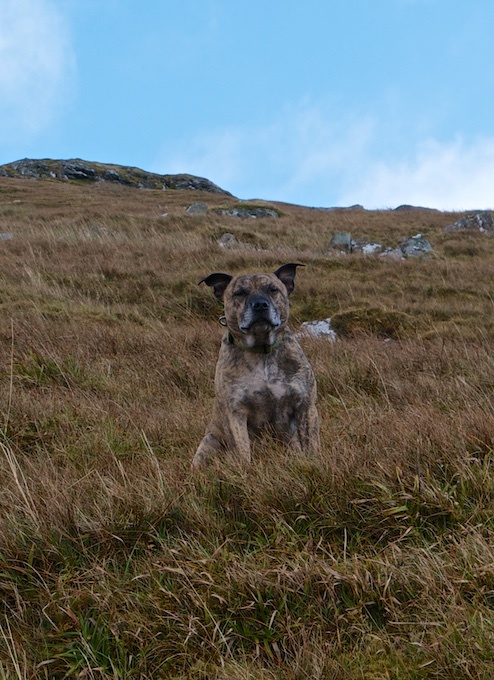 It was good t finally get some sunshine Dawn, Reuben is happier when the sun shines on the hills. He’s not too keen on rain! Enjoyed both Pt & pt2, great photo’s, thanks. Cheers Paul, there is still a part three to come yet! 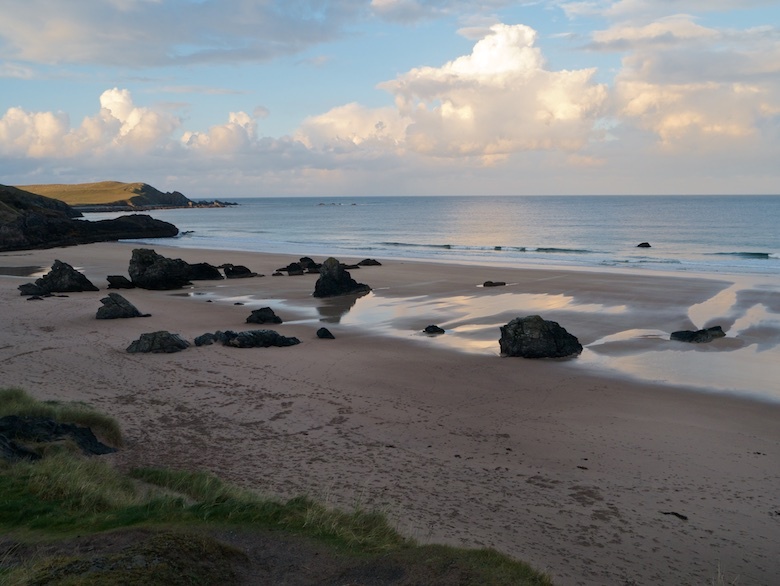 Another great post – love the beaches up there especially around Durness. 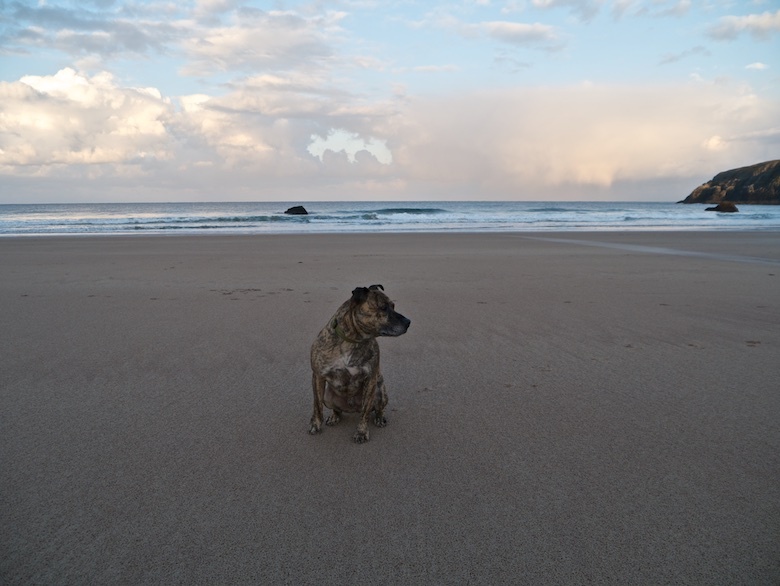 Yes the beaches are superb, plenty of them to explore and not too many folk about. 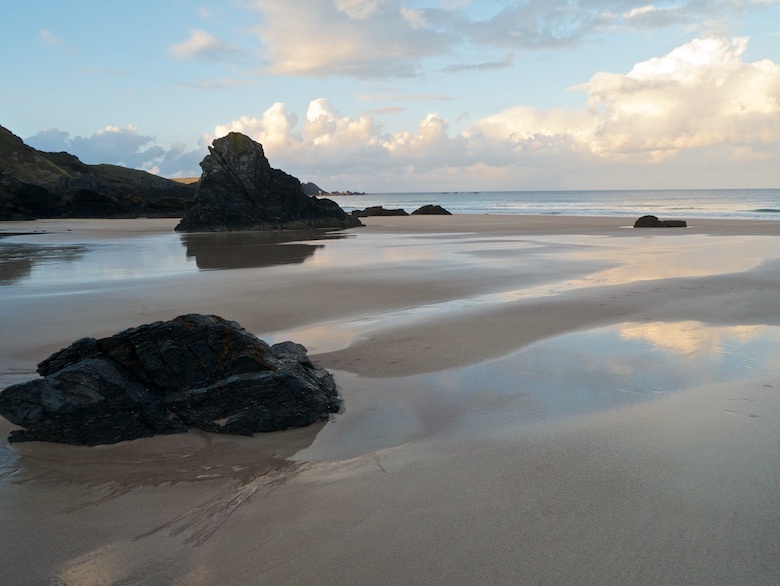 It’s hard to beat those empty, atmospheric Scottish beaches isn’t it? Especially if you’re a dog! Reuben does love to have a run about on an empty expanse of sand, something goes in his brain that makes him very happy. Beaches and hills there do make for a fine trip. Great posts James. A great combination Martin, would be great to have both on a backpack I think. A favourite part of the UK for me, shame (or perhaps a good job!) it’s so far away. Enjoy your trip there next year. Great post and Part 1. 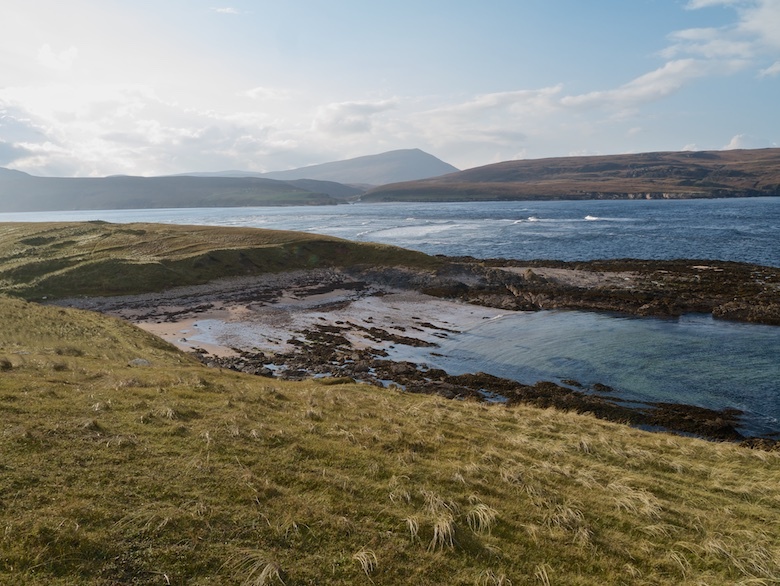 Never been that far north in Scotland – looks a fantastic area. You need a good week to justify such a long trip, but it is worth the journey Mark. Love it up there. Wonderful pics James. We stayed on that site in June more than twenty years ago, it sounds like the pub hasn’t changed. We were woken one night by a gull which had got trapped between the tent and flysheet. What a racket it made! 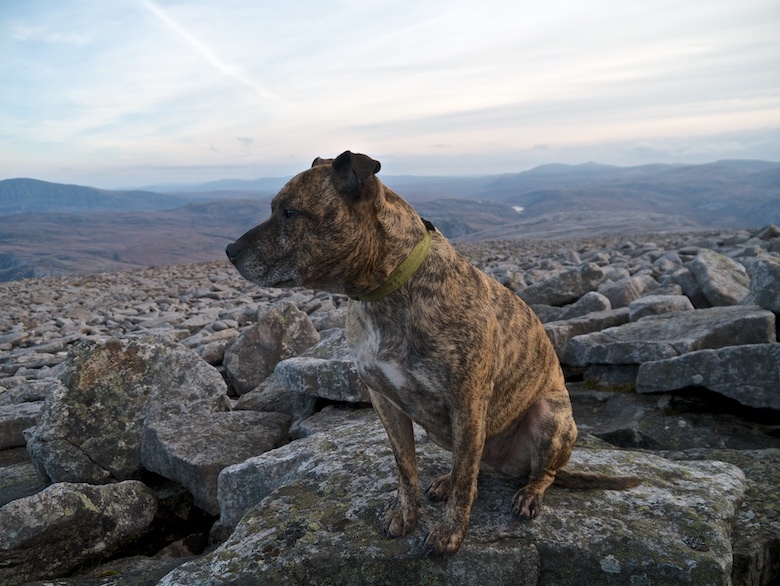 It was 2:30 in the morning but still not properly dark so we got up and went up Ben Hope to see the sunrise. Must go back sometime. A great write up an pics as per usual. Looking forward to reading part 3. 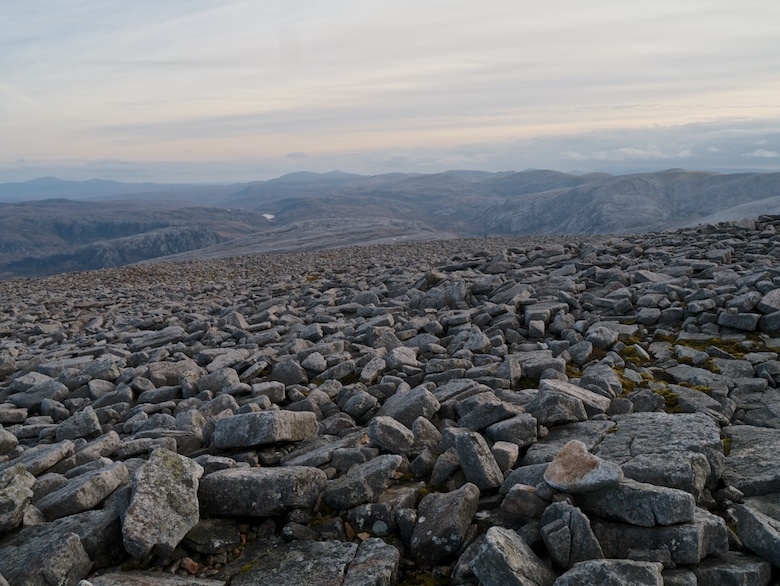 Walked up those couple of Corbetts a few years back. We had superb views to, like yourself. An amazing mix of land and water. Happy memories rekindled of a fine week in the area based out of Kinlochbervie. Those two Corbetts, Foinavon, Arkle, Sandwood Bay. You could spend a lifetime up there and never tire of it. It is good up there. I spent my 40th in a camper van in Durness and too bought some good beer from the shop!